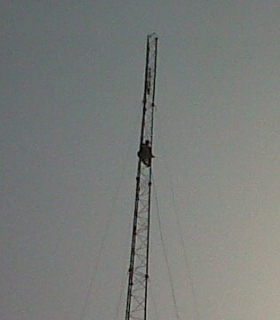 A middle-aged man yesterday climbed a telecommunications mast beside the Federal High Court in Abuja. He was first feared by some to be a bomber, but was soon realised to be suicidal as he threatened to jump down and kill himself. The man, Mallam Inuwa Musa Tawakalitu, who had earlier lodged a complaint and submitted documents at the court, climbed the mast at about 12 noon. He later threw a note down in which he stated that he climbed the mast because he wanted people to intervene in a dispute between him and former vice president – Atiku Abubakar, who he claimed owed a N15million debt to him. He then demanded for the Inspector General of Police, saying he wouldn’t come down until he showed up. He was eventually persuaded to come down by members of the National Emergency Management Agency, as well as the police. Mallam Garba Shehu, Alhaji Atiku’s media aide, told newsmen that the man was insane. “Left for me, I will say that the man should simply be ignored. He will climb down when he gets tired of staying up there”. The man was reportedly taken into custody when he got down. Methinks Atiku needs to fire his media guy already! Aside of advertising his half-education (how does a media aide not understand correct use of English? mental? ), he is not helping his (Atiku's)image of being a harsh business person. What does it matter if the man never gets anything? Being sympathetic and showing compassion should have been the way to go (for a media aide) except if his job was to further batter his principal's image which this person has successfully done!